Snow in SecondsTM fake snow is a powder with super-absorbing "tiny sponge" properties. 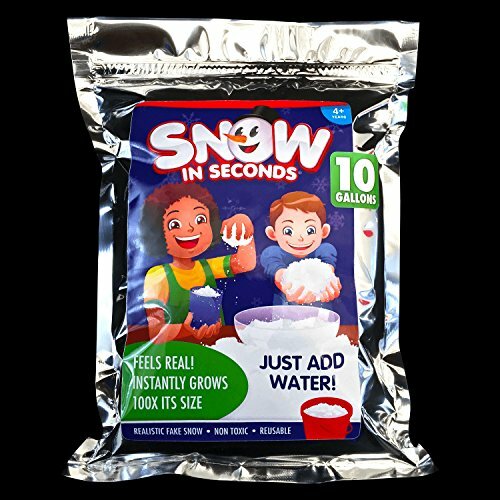 It is safe, non-toxic, and will "erupt" into snow when you add water - Instantly! Snow in SecondsTMis long laster, never melts and is so realistic it is cold to the touch! It is used at ski resorts, in photo shoots, and by movie makers to create realistic easy to clean snow. Snow in SecondsTM makes it easy for you to bring the high tech powder used by professionals in movies into your home affordably! Looks and Feels like real snow! - Even cold to the touch! Create memorable snow themed parties, inside and outside! If you have any questions about this product by Snow in Seconds, contact us by completing and submitting the form below. If you are looking for a specif part number, please include it with your message.